A method to measure the electronegativity of individual atoms on a surface could be used to study structural and reactivity variations in heterogeneous catalysts. In 1932, Linus Pauling defined electronegativity as the ability of an atom to draw electrons toward itself. He then calculated electronegativity based on bond energies measured in gaseous molecules. Chemistry textbooks commonly have tables of Pauling’s electronegativity values, with caesium being the least electronegative and fluorine the most. Today, scientists can measure bond energy from a single atom using atomic force microscopy (AFM). 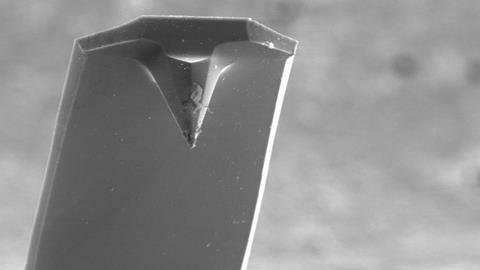 In this technique, a tiny cantilever beam bounces a tip, sharpened to an atomic point, near an atom on a surface. The microscope then draws the tip away from the surface to move the atoms within and beyond the length of a bond between them. Forces between the two atoms change as the distance between them grows, and these changing forces alter the vibrations travelling through the cantilever. By measuring the frequency shift of the cantilever vibrations, researchers can determine the bond energy between the tip and the surface. Jo Onoda, at the University of Tokyo, and his colleagues wondered if AFM measurements of the bond energy between different atoms would reveal polarisation due to electronegativity differences. To test this idea, the researchers embedded oxygen atoms in a silicon surface and used AFM to measure the bond energy between an oxygen atom on the surface and a silicon atom on the point of the microscope tip. To account for natural variations from each tip, they repeated the measurement several times, using different tips each time. The researchers also repeated the AFM measurements for silicon surfaces containing aluminium atoms, which are less electronegative than silicon, as well as surfaces containing tin or germanium atoms, which have about the same electronegativity as silicon. The bond energies measured for a silicon atom and one of the introduced atoms on the surface fit an equation derived from Pauling’s equation for the bond energy of a polar covalent bond. One term in that equation reflects the ionic energy resulting from the difference in electronegativity between the tip atom and the atom on the surface. To compare these values to common electronegativity measurements, the researchers correlated their measured ionic energies with Pauling’s electronegativity values, using modelling to confirm that Pauling’s values for silicon approximates the tip electronegativity. They found that electronegativities measured with AFM closely matched Pauling’s values. Though Onoda and colleagues measured the electronegativity of single atoms, electronegativity is generally considered to be a property of a molecule. 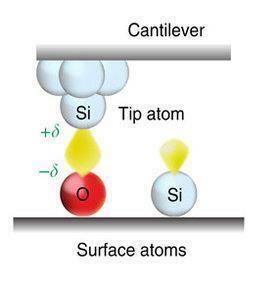 The elemental environment around a given atom can affect its measured electronegativity. To see if this AFM approach could detect environmental effects on electronegativity, the researchers synthesised a surface with a silicon atom bound to two oxygens. The measured electronegativity of the silicon in silicon dioxide was greater than that of a pure silicon atom, supported by computer modelling that showed greater electron density on the silicon in silicon dioxide compared with a pure silicon atom. Onoda thinks this technique could be used to study the surfaces of transition metal oxide catalysts, which are known to have a variety of active sites. Electronegativity measurements might help map reactivity across the surface, he says. ‘Electronegativity has never been an easy thing to measure with any technique,’ says Hannes Schniepp, at the College of William and Mary, US. He likes that this approach works well at the scale of individual atoms because principles that apply to collections of atoms do not always apply at the atomic level. When I first knew the notion of electronegativity, I just accepted it without too much thinking: it just shows the ability of an atom to draw the electrons. However, after reading this article, I start to realize that the knowledge that we take it for granted is actually worth of thinking and reexamining. Nothing can be accepted without grounded evidence. Before accepting a new notion, we had better already have a deep thinking. This article is helpful, thanks!